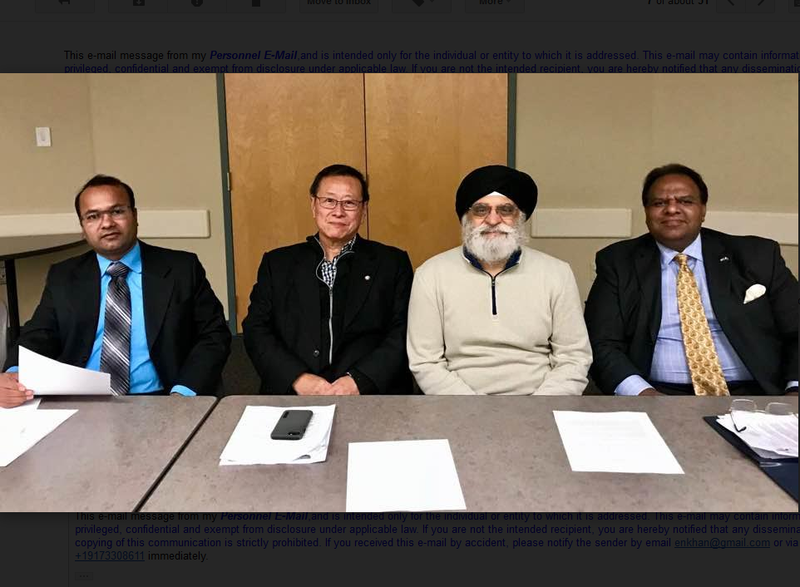 Frustrated about an incident involving Burmese immigrants and an Albany Police officer, members of the South Asian community in the Capital Region gathered Monday. Nisar Khan is a community activist who co-organized the gathering at the East Greenbush library in response to a recent incident reported in The Albany Times Union. An officer was said to have shouted "If you're going to live in this country, you need to learn to speak English" during a response to a domestic violence call. A witness at the scene described the people involved as Burmese immigrants who had a difficult time communicating with police. Khan says the members of the community from Bangladesh, India, Pakistan, Nepal, Sri Lanka and Burma have joined hands to spread a message of tolerance and peace. "I think it is important for the community to be vocal. Unfortunately our community are not vocal at all. And if we see what the cop did in Albany, and if he has done this thing, I think it is important for the community to come out and talk about it. Unfortunately, when a cop comes out and says that, you know, if you don't speak English then you need leave the country, it is important for the community members to come out and say something. It's nothing to be scared of. We are just airing our voice that if somebody's out there that doesn't understand the accent, maybe there should be a officer training course that should be available within the community membership and the police force." Khan suggests retaining interpreters who would be on call to assist in language translation. Acting Albany Police Chief Robert Sears breaks down the "extremely chaotic" situation his officers encountered in responding to the call near Grand and Elm Streets. "They encountered six or seven intoxicated people and they were having a very difficult time communicating. The tool that we give the officers is called Language Line. What you do is you call up and there is a translation service over the phone. However, on that night, the dial app for the language that was needed was not available, so we had a very difficult time trying to communicate. There was the potential of a young child being hurt. We got a little frustrated. What we’re trying to, at least from my perspective as a chief, 'cause I wanna give the guys all the tools that they need, that's my job. My job is to make sure that when the officers go out on the street, they're able to do their job." Sears says grant money has been obtained through the Open Societies Foundation and the Global Institute For Health And Human Rights at SUNY to fund an initiative set to begin January 1st. "We're actually going to be developing more infrastructure not only for the police department but other systems in local government to better navigate some of the immigrant populations that we have here in the city. You know, whether it's anything kind of law enforcement or getting jobs or getting children registered for school. So there's a couple of things going on here so hopefully a situation like this doesn't happen where our folks are so frustrated that they do say something that they regret." 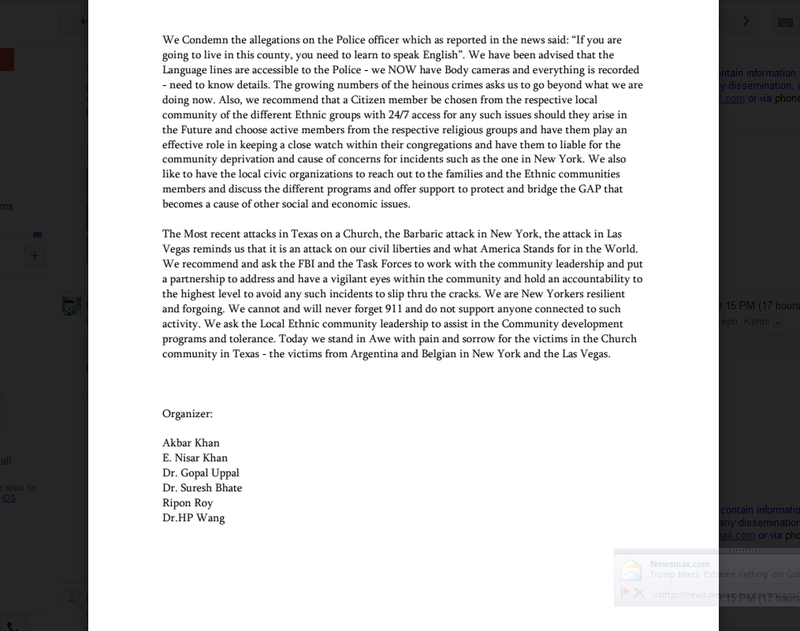 The South Asian Community group also condemned recent incidents of terror and violence in Texas and New York City: "The Most recent attacks in Texas on a Church, the Barbaric attack in New York, the attack in Las Vegas reminds us that it is an attack on our civil liberties and what America Stands for in the World. We recommend and ask the FBI and the Task Forces to work with the community leadership and put a partnership to address and have a vigilant eye within the community and hold an accountability to the highest level to avoid any such incidents to slip thru the cracks. We are New Yorkers resilient and forgoing. We cannot and will never forget 911 and do not support anyone connected to such activity. We ask the Local Ethnic community leadership to assist in the Community development programs and tolerance. Today we stand in Awe with pain and sorrow for the victims in the Church community in Texas - the victims from Argentina and Belgian in New York and the Las Vegas." 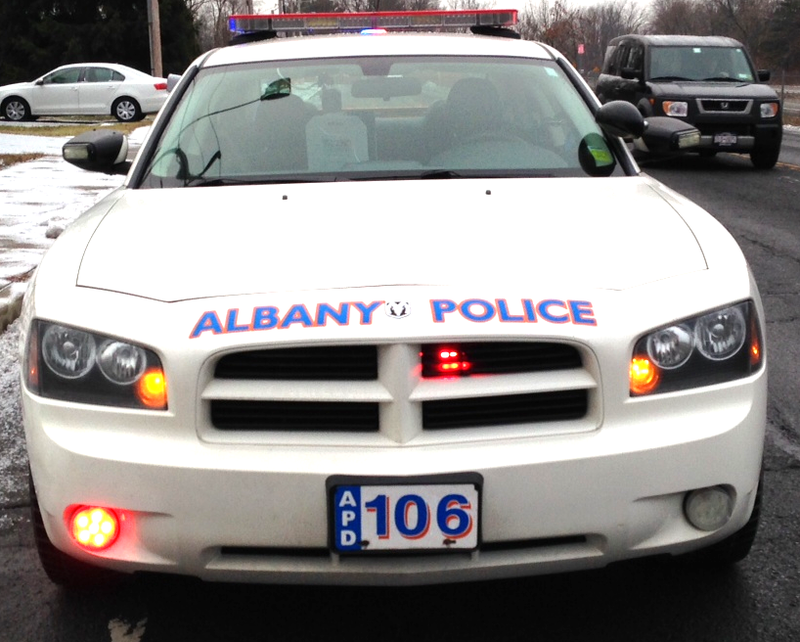 After two years of preparation, the Albany Police Department body camera program goes live next week. 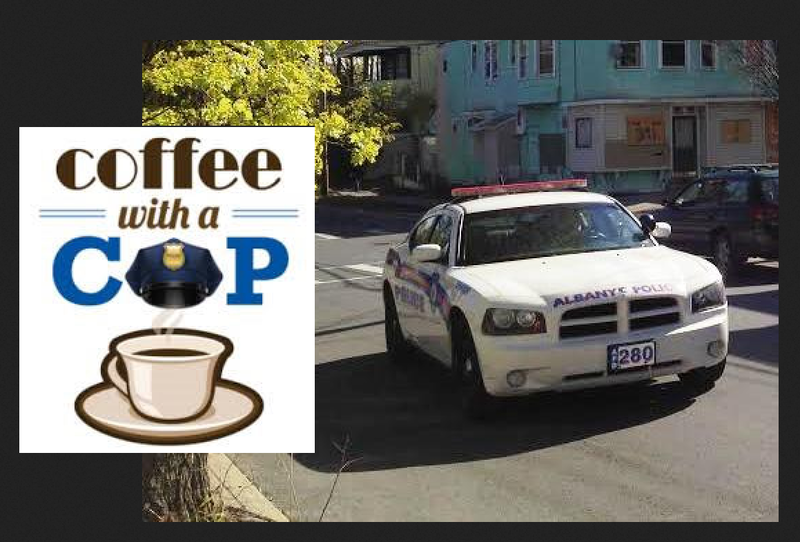 The Albany Police Department has been working to improve community relations with several initiatives in recent years. WAMC's Capital Region Bureau Chief Dave Lucas attended "Coffee With A Cop," held this morning outside police headquarters in Arbor Hill. The Center for Law and Justice says some Albany residents are angry about a recent announcement that state troopers will help patrol neighborhoods in the city.